Evil Inc » Buy “Stripped” today! We’re going to do a big push to tell people to make their purchase today. We want to give this movie a big push to get it wide recognition. We’re going to try to get as much notoriety for the movie as possible by making it #1 on iTunes. And we can do it if we act together. Here’s the link to get it from iTunes. Here’s the first five minutes of the film. Folks, Kellett and Schroeder have made what will undoubtedly become the finest documentary on the art of cartooning ever. This goes waaaaaaay beyond “Print vs. Web.” This is a sensitive, moving, endearing, warm all-encompassing look at cartooning from several different perspectives. Heck, I’m even in it! It shows people who couldn’t possibly have anything at all in common all telling remarkably similar stories about their passion for the craft. It talks about the very nature of creativity. It talks about thunderous successes and heartbreaking failures. But mostly, it talks about cartoonists and their burning need to make comics. But, listen… don’t take my word for it. 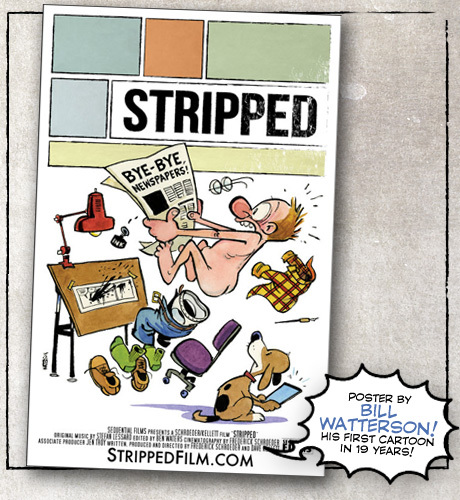 All you need to know is this: Bill Watterson drew his first public cartoon since the last Calvin and Hobbes to promote this movie. Can you imagine how many offers he’s had in all those (almost 20) years?! — how many good causes… fun projects… deserving people? He quietly said no to them. If that doesn’t make you ache to own this film, then I got nothing. You’re going to watch this movie once and then sit there in quiet awe as the credits roll. And then you’re going to listen to it over and over and over in the background as you pencil or ink or sketch or wash dishes or… well, you get the point. This movie goes beyond good… it’s important. You’ll never look at your drawing board / Cintiq / sketchbook the same again. Is there a way to buy it if we don’t use iTunes? Q: WHAT IF I DON’T LIKE iTUNES, OR CAN’T USE iTUNES? A: No problem! The film will be available on Google Play, on VHX (DRM-free), and on DVD (DRM-free)…all on April 2nd! But maybe you can still help us out on April 1st, and spread the word to friends who use iTunes? It’s a great film; I went to the premiere in Hollywood (yep, because Dave Kellet has gone “Hollywood” on us!) and the Q&A with Dan Piraro and the other cartoonists was hysterical. Here’s hoping Fred and Dave make their iTunes goal!